Someone who will not back down to anyone. Once you’ve selected your answers, then think about which two Donald Trump might select. Then try Hillary Clinton and Bernie Sanders. Our thinking was that the top and the bottom choices would be more Trump-like; in fact, more reflective of the Republican Party. Similarly, our hypothesis was that the middle two options would be more representative of progressive thinking. These two characteristics seem to characterize several recent Democratic presidents, most particularly John F. Kennedy and Barack Obama. Democrats (in blue) selected these two options 81% of the time; five times as often as random selection would be. Republicans (in red) selected them only 30% of the time. Republicans generally favored at least one of the two more “macho” choices. As you look at the current debate among 2016 presidential candidates, Hillary Clinton and Bernie Sanders seem to focus much more on issues than do the Republicans. 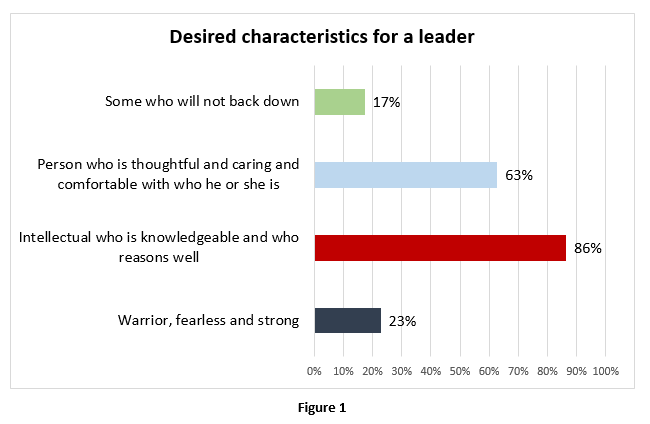 Clinton and Sanders both come across as “thoughtful and caring; comfortable with themselves” as well as “knowledgeable and capable of reasoning well.” The GOP candidates reflect more of the warrior mentality (particularly with Rand Paul having dropped out) and as individuals who will not back down, especially Donald Trump and Marco Rubio. We asked respondents the same questions about what characteristics they would like in their boss. The graph below shows the comparisons of different groups in terms of what they want for a leader of the country vs. a boss. 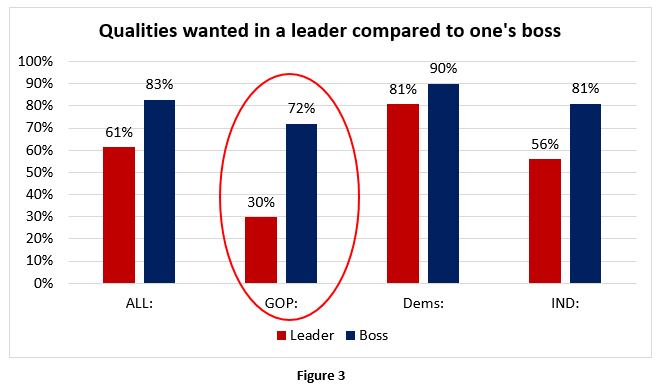 The red bar reflects what they want in a leader; the blue bars are what they want in a boss. 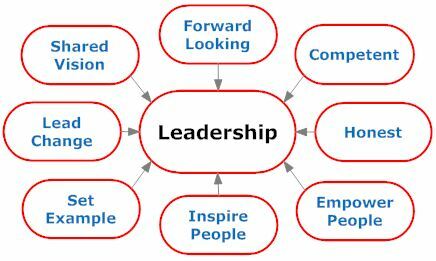 When it comes to the “thoughtful, rational, caring, comfortable” options, all groups think that is more important in their boss than in a leader for their nation. But the biggest spread among them is with members of the GOP. Republicans seem to want what might be called the “integrated personality” for their boss, but not nearly as much in their national leader. 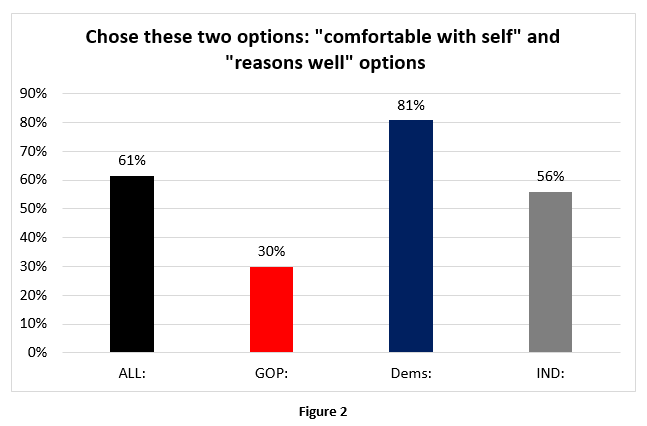 Democrats favor more a person who is “comfortable with who he or she is.” This is why Democrats generally have the good sense to reject uncomfortable individuals for president like Richard Nixon and George W. Bush. The question remains, do Republicans seem to prefer someone who is not comfortable with him or herself, or do they just not notice? Democrats seem to reject the one-dimensional thinking of “someone who will not back down” or a “warrior, fearless and strong.” Does this mean that they have favored “weak presidents?’ It is interesting that during Jimmy Carter’s presidency, no American soldiers were killed in combat. and during Bill Clinton’s presidency, only one American soldier was killed in combat. Were they weak? Doubtful. But they were judicious.